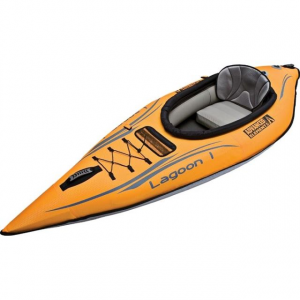 A lightweight inflatable solo recreational kayak, designed for use on ponds, lakes, and slow-moving rivers. Deck is supported by aluminum arches fore and aft of cockpit opening, for greater rigidity. Made from Nitrylon, a laminate of synthetic and natural rubber over 1200-denier polyester. Ideal for ponds, small lakes, and slow-moving rivers. High-quality bayonet valves allow quick and reliable inflation in three separate main chambers. Soft and comfortable inflatable seatback is removable. Gear bungee in stern. Repair kit and pump hose valve adapter included. 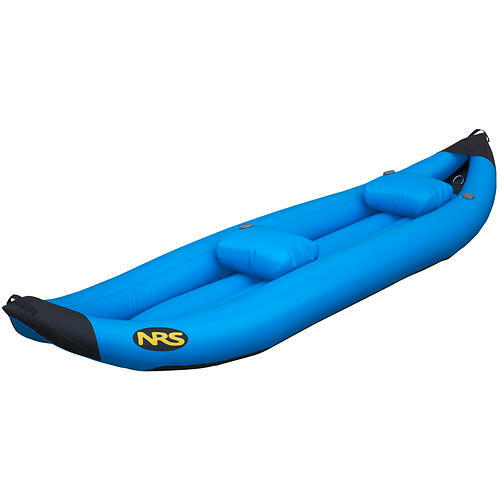 We recommend the NRS Bravo Wonder Pump 6 or L.L.Bean Stowaway River Pump for rapid inflation. A removable tracking fin is included. Imported. 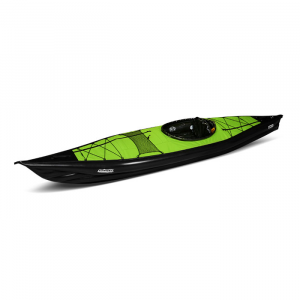 Innova Swing I Inflatable Kayak - The Swing I Inflatable Kayak by Innova is a decked inflatable boat with handsome lines that cuts through the water perfectly. Fast, light and green, the Swing I is divided into three separate air chambers for safety, using an efficient tubeless system. The hull is made of Nitrylon Lite, a rip-stop polyester fabric, rubber-coated on the interior for air-retention, and Teflon-treated on the outside for water repellency and stain resistance. The air-holding seams are vulcanized and permanently bonded, similar to the way in which tires are vulcanized, and each chamber is individually tested at the factory for air retention. The Swing I inflates to a higher pressure than competing bladder kayaks - 3-psi vs 2-psi - the higher pressure means that the Swing is stiffer in rough water and has a snappier paddling performance. The deck is urethane-coated with zippered access for gear storage and cleaning ease and sheds water quickly and easily. The aft zippered deck opens completely in two flaps for full access and both decks are provided with gear bungees. The deck support system uses aluminum arches fore and aft of the cockpit opening and these arches are set crosswise and provide a deck shape and structure. The arches contribute to the stiffness of the Swing for paddling in rough water and these arches can be removed easily for a compact folded package, or left in the kayak for a slightly larger folded size. The valves are sophisticated bayonet style units set flush with the fabric surface and a pressure relief valve is installed in the kayak floor chamber to relieve possible overpressure. The Swing has carrying handles on each end, while set up time is about 5 minutes, and the icing on the cake is that the Swing is PVC free! 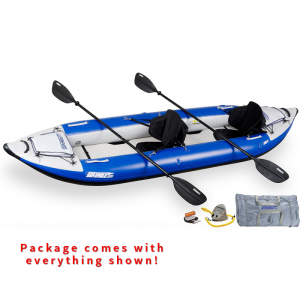 If you are as serious about your kayaking and your environment, as you are about your fun, you should check out the Innova Swing I Inflatable Kayak. 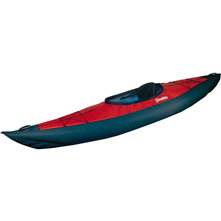 Innova's Swing 1 inflatable single kayak is designed to be quick and lightweight and is built in an environmentally friendly way. The Swing is a decked kayak with a hull shape built to handle anything from a flatwater lake to Class II rivers. It's tubeless construction allows the hull to be inflated to a higher pressure than most other inflatables, creating a stiffer and more efficient boat. Easy to store, transport and set up - the Swing I inflates in about 5 minutes and easily dries off and packs away again for the next adventure.Efficient, lightweight and durable inflatable single handles anything from a small lake to a class II rated river.Hulls are made of LitePack rip-stop polyester fabric, rubber-coated on the interior for air-retention, and Teflon-treated on the outside for water repellency and stain resistance.Air-holding seams are vulcanized and permanently bonded (similar to the way in which tires are vulcanized). Each chamber is individually tested at the factory for air retention.Deck is urethane-coated with zippered access for gear storage and cleaning ease. The decks shed water quickly and easily.The deck support system uses aluminum arches fore and aft of the cockpit openings. These arches are set crosswise and provide a deck shape and structure. The arches contribute to the stiffness of the Swing for paddling in rough water. These arches can be removed easily for a compact folded package, or left in the kayak for a slightly larger folded size.Three separate air chambers provide safety ? in the unlikely event one is ever compromised, there is sufficient flotation to be able to navigate the kayak to shore.Bayonet style valves make it easy to inflate and deflate and will not leak air.A pressure relief valve is installed in the kayak floor chamber to relieve possible overpressure.Kayak kit includes tracking fin and repair kit. Ready for your next adventure, the Innova Swing I kayak inflates in minutes to get you out on the water. 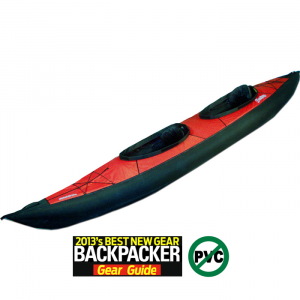 The Innova Swing I inflatable kayak offers reliable performance on flatwater and slow-moving rivers. 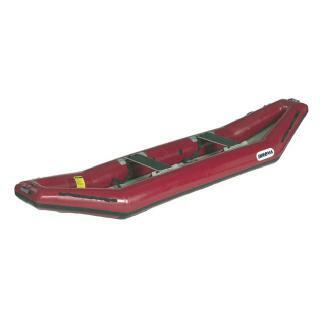 It's great for those who don't have the storage space for a traditional, rigid kayak; packed dimensions are 27 x 15 x 9 in. Nitrylon, a rugged polyester/rubber laminate, on the outer hull helps ensure lasting service with superb abrasion and puncture resistance. Nitrylon is constructed without PVC. Water and stains easily roll off outer hull thanks to a Teflon(R) treatment. Tubeless Nitrylon construction offers several advantages over vinyl bladders with a zip-on hull. First off, you'll enjoy a more responsive boat thanks to light weight and an inflation pressure of approximately 3 psi. Secondly, it's easier to break down the tubeless Swing I at the end of the trip because water cannot be trapped between vinyl bladders and a zip-on hull. Aluminum arches create a stiff and responsive watercraft; arches may be left in place for a slightly larger packed size. Bow, center and stern spray decks offer refuge from chop. Zippers offer access below decks to gear stored underneath; rear zipper opens into 2 flaps and provides full access. Bungee rigging stores extra gear, such as a spray jacket or paddle float, within easy reach. Backrests offer full support, making long excursions comfortable. Carry handles assist in portaging kayak to and from the water. Includes a tracking fin and repair kit. Approximate inflation time with standard pump is 5 min. (pump not included).